Despite Edwin Uceta's struggles since being promoted to Rancho Cucamonga, there was no apprehension from Quakes manager Drew Saylor to give the bulk of the innings to the 20-year-old in an important playoff game. On Friday, Uceta matured before right before his skipper's eyes. The Dodgers' No. 15 prospect following rehabbing big leaguer Dennis Santana and spun 5 2/3 two-hit innings as Rancho Cucamonga blanked Lancaster, 1-0, on Friday at LoanMart Field to take a 2-1 lead in the best-of-5 California League semifinals. "I think the thing to be aware of is he's ," Saylor said. "You're talking about a kid that would be [in college] and we're asking him to throw Game 3 of the California League playoffs. I just think his natural maturity, his work ethic, the way he's bought into his advanced process and our gameplanning, it speaks volumes to who he is and what he believes in." The native of the Dominican Republic earned a promotion from Class A Great Lakes after compiling a 3.25 ERA in 20 Midwest League starts. 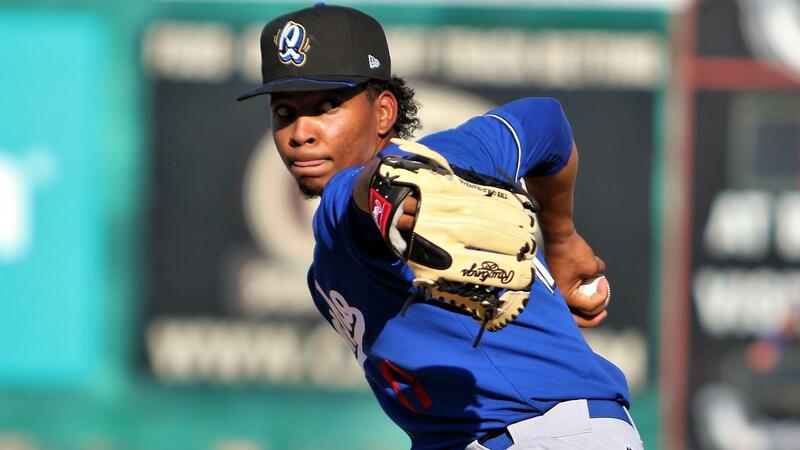 But Uceta (1-0) scuffled in five starts for the Quakes, posting a 6.97 ERA. The sink-or-swim moment on Friday was a worthwhile experience for Uceta and for the organization, according to Saylor. "We're a pretty aggressive organization in terms of promoting guys and challenging them and I think there is a trend in the rest of the game trying to catch up to us," he said. "I think these moments are so valuable in their personal development but big picture. We expect our Major League team to compete, and what better opportunity to do that when you're in the Minor Leagues year in and year out? "This year, to have all of our domestic teams make the playoffs, I think that it's invaluable to their growth and development. So when they get on the big stage, they've already had that experience." After Rockies No. 11 prospect Tyler Nevin singled leading off the fourth for the JetHawks' first hit, Uceta retired the next 10 batters. Vince Fernandez ended the run with a one-out walk in the seventh Willie Abreu singled two batters later to chase the right-hander. The recent development of Uceta's pitching philosphy and mentality on the mound paid dividends in the postseason. "You see guys that come up from [Class A] and especially with young players, there is a little bit of a learning curve," Saylor said. "'Do I belong?' I think naturally with young pitchers they just want to use their stuff, and this a level and reaching back and just trying to throw your best fastball, it's just not good enough. "And I think what he has learned is he does have a good enough fastball when he locates and he tunnels pitches and as he's went through the later stages of August and into September, he really started believing in his preparation into his gameplanning. He's working really well with our catchers, and I think that's kind of what you're seeing is that belief and that confidence in the game plan." Dodgers No. 30 prospect Omar Estevez ambushed a first-pitch offering from JetHawks starter Matt Dennis in the sixth and deposited it over the left field fence to provide all of the scoring. Sixteenth-ranked Connor Wong doubled leading off the second but was thrown out trying to score on No. 24 prospect Cristian Santana's single to right. "It's great to have players put together good at-bats; Omar missed a few fastballs early in the game, then hit a soft single into right and then to be able to come up big in that at-bat and tattoo the fastball, a no-doubter over the left-field fence, it's obviously big and I was able to breathe a little bit of a sigh of relief." Santana, the Dodgers' fifth-ranked prospect, walked two and struck out one in the first. Following Uceta's exit Austin Hamilton, Yimi Garcia and Dan Jagiello combined on 2 1/3 perfect frames, with Jagiello earning the save. Dennis (0-1) took the loss, allowing five hits -- including the solo homer -- and a walk while striking out six. Rancho Cucamonga can clinch a berth in the Championship Series with a win in Game 4 on Saturday at LoanMart Field.